Not too long ago, Hilarie was working with a client and going through printed photos to include in her heirloom family history book. One old photograph showed a woman holding something. The photo was too dark to be certain, but you could make out the outline of what appeared to be a newborn baby. Because the photograph was mostly taken in the shadows with very indistinct figures, Hilarie’s first reaction was to “toss it.” By itself, the photo added nothing to the narrative we were working on. However, the woman saw this photo and immediately went back to the time and place it was taken. It triggered an important memory. She told a detailed story of the birth of that baby and the new mother. The story she told had incredible value to their family narrative, and the fact that this seemingly-worthless photo had triggered that memory made that photo into a valuable part of the narrative, too. Until this happened, the wonderful story that woman told had only been in her head. How can you make sure that the stories of a picture are included with the picture? This is an example of metadata. If you would describe yourself as a photographer, you need to know what this means. If not, feel free to ignore most of it. Metadata. Raise your hand if you know what that is. It sounds like something technical, in a scary kind of way, doesn’t it? 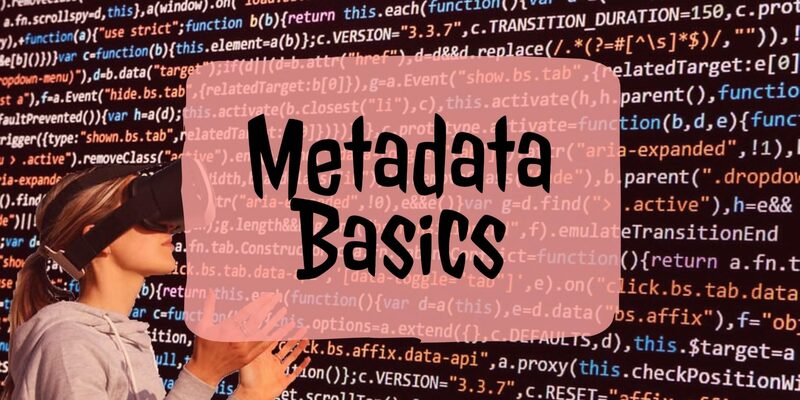 Metadata does contain a lot of technical information, BUT you don’t need to fear it (or even pay any attention to the technical aspects of it). 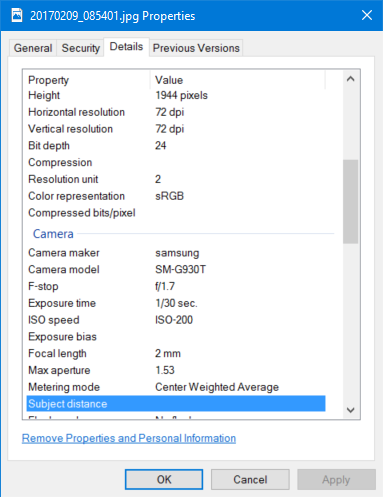 The picture to the left shows part of the metadata for a picture on my computer. You can see things like bit depth, F-stop, and ISO speed. If you’re a photographer, you’re likely already familiar with what this information means. If not, you can safely ignore all but a few of these fields. First, let me explain how you can get to this same window (on a Windows PC). In the file explorer, navigate to the photo you want. In the Properties window, click the “Details” tab. Or just watch this short video. You’re now looking at the metadata for that specific file. You’ll see there is a lot of information you can include about a photo, but for curating and keeping memories, there are only a few you need to focus on, and they are, luckily, all at the top of the Details list (at least in Windows). These are where you would store the story (or stories) of that image. You don’t have to use all of them; you may only want to use one or two. But stay consistent. For example, you could choose the title field to include the date and place the photo was taken, and in the subject field type the full names of the people in the picture. Then you could use the comments field to include the story/stories of that photo. In most cases, just add the story in the comments field. Once you’ve done that, click apply and OK, and you’re done. You’re now a metadata ninja. The great thing about metadata is that it remains with the photo (usually, more on that in a minute). Copy it, email it, post it to Facebook (well…not so much). That information stays with the photo. Now you can keep the pictures with the stories. Just remember that if you share it publicly, anyone can see the metadata. Also, other people can change that information, so you will always want to keep an original copy somewhere. While adding the stories to the photo metadata is the best way to keep them together, it is easy to get confused about where a photo and its metadata are. This is because popular online storage options hide the metadata…sometimes. An easy way to share photos with family is using services like Dropbox, Google Drive or Google Photos. If you upload images to these, the metadata is hidden in the web view (i.e. if you are accessing it from dropbox.com, drive.google.com or photos.google.com). However, if you download the file, you can see it. Alternately, if you download and install the respective desktop client, you can see the metadata there (because it’ll be just like viewing those files in Windows Explorer). It can be confusing, I know. Just remember that if you use a cloud-based storage service, it should keep the metadata. If you’re using something other than Dropbox or Google, double check with a test photo first. Then remember that if you are viewing pictures in a web browser, the metadata is hidden. If you are viewing those files in Windows Explorer, metadata can be seen. One thing to keep in mind about Google Photos: there is a “description” field for photos, but it does not appear to be tied to the metadata. If you add something there & then download that file, the “Photos” description won’t show up. If you share on Facebook, the metadata will be stripped away. This doesn’t mean don’t share on Facebook. What you could do is copy the metadata, share the photo to Facebook, then paste the metadata in the “say something about this photo” area when you upload it (if it’s something you want shared there). So if you aren’t already, start using the metadata fields to capture stories and keep them with pictures. If in doubt, always remember to test the platform you’re using to make sure everything is preserved.